Credit card lending continued its rise across the credit union industry in the first quarter of 2018. Total balances topped $57.2 billion as of March 31, that’s a year-over-year increase of 9.8%. Credit unions also reported a bump in the average credit card balance. That has increased $125 in the past 12 months to reach $2,895. Credit card usage increased 9 basis points annually to 31.1%. 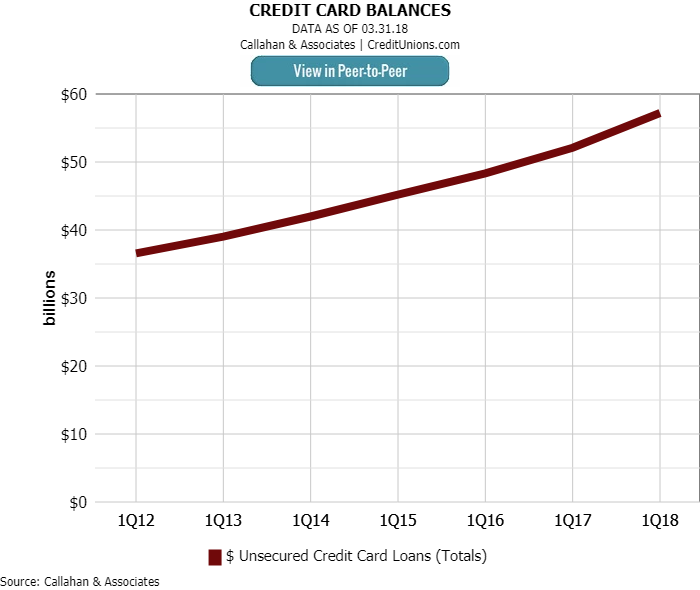 Credit card balances held by U.S. credit unions increased 9.8% year-over-year and topped $57.2 billion in the first quarter of 2018.
Credit cards accounted for 5.8% of the credit union loan portfolio as of March 31. This was in line with portfolio share from one year ago as credit card balances grew in line with the overall loan portfolio. 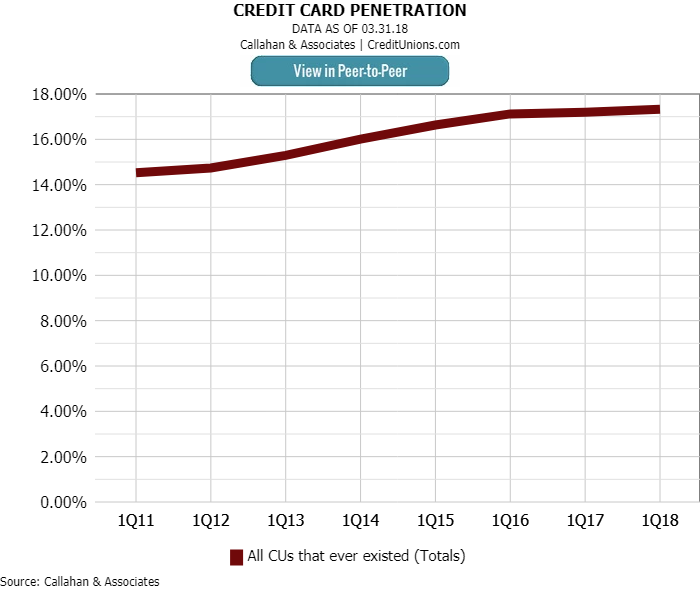 Credit card penetration, however, has accelerated across the credit union industry. The percentage of credit union members who held active credit card accounts rose 7 basis points between 2016 and 2017. That was up 23 basis points annually to 17.3% as of March 31, 2018. Growth in credit card penetration has accelerated in the past year and grew 23 basis points year-over-year to 17.3% as of March 31. Overall, U.S. credit unions extended just shy of 1 million new credit card loans over the past 12 months. 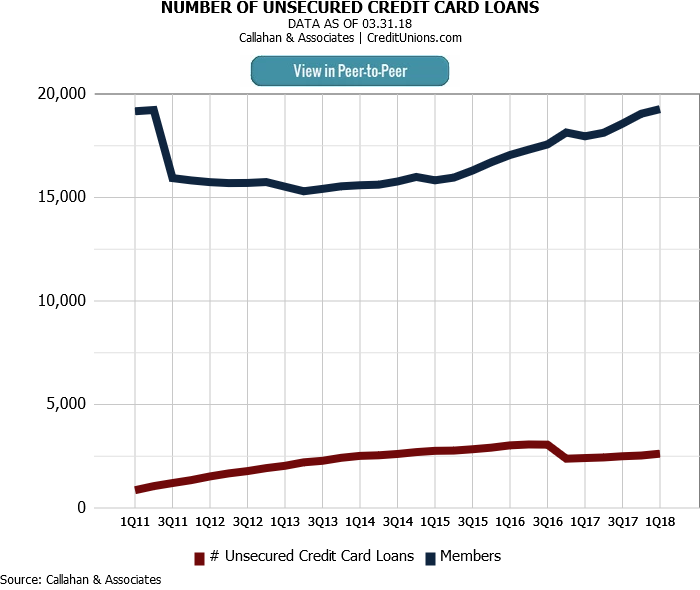 Membership increased by 4.7 million, but credit card loans increased by a higher ratio, leading to the accelerated penetration rate. Unsecured credit card loans increased at a faster rate than membership, which lead to an acceleration in credit card penetration rates nationwide. Credit card delinquency increased 15 basis points year-over-year. It was 1.09% as of March 31, 2017, and rose to 1.24% as of March 31, 2018. This is still below the 1.40% average credit card delinquency rate for FDIC-insured institutions. Moreover, credit unions report an account delinquent at 60 days past due, whereas FDIC-insured institutions use a 90-day threshold. 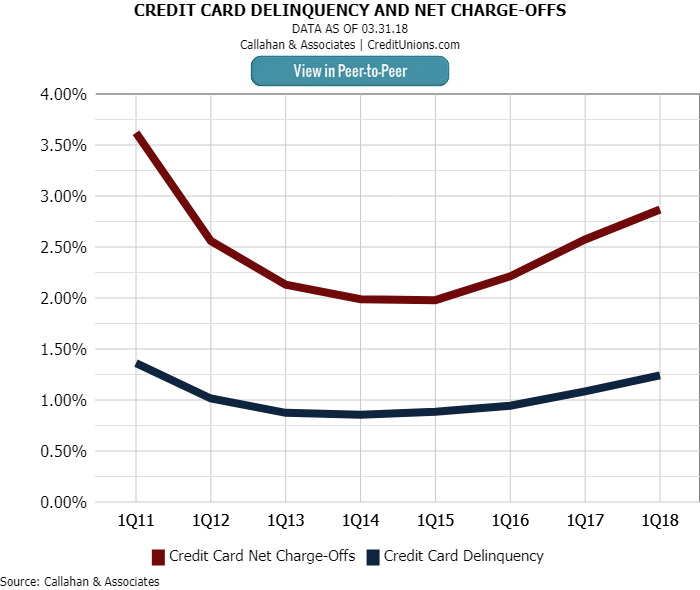 The average net charge-off for credit cards has also risen 30 basis points since the first quarter of 2017. It stood at 2.87% as of first quarter 2018. Although credit union credit card delinquency continues to rise, up 15 basis points year-over-year, it still remains 16 basis points below FDIC insured institutions as of March, 2018. How does your credit card portfolio stack up against peers?